When Can Child Support Be Modified in Florida? If you and your ex-spouse or ex-partner have a child in common, then you already know that courts are compelled to establish the child support obligations of each parent. 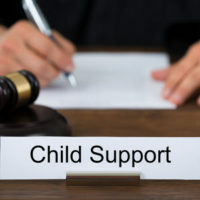 Child support obligations are ordered not as a punishment against one parent but in order to provide the child (as much as possible) with financial support. Must change jobs and is not receiving the same benefits he or she used to receive at his or her previous place of employment. Similarly, a change in circumstance can also be where one party, or both parties, experience a significant increase in income from the time in which the original child support order was entered. The change in circumstances must be significant enough that when the child support calculation results in a difference of $50 or 15 percent (whichever is greater) between the amount previously ordered and the amount calculated using the updated information. So, for example, if a parent had been ordered to pay $250 and a change in circumstances resulted in a calculation that the parent would only be expected to pay $200, then a court will modify the child support obligation to the lower amount. A child support order must be properly calculated initially and any time there is a change in the circumstances of one parent or the other. Failing to do so not only deprives the child of the standard of living he or she could have reasonably expected but it also potentially jeopardizes the payor-parent’s financial stability and solvency. If you have been ordered to pay child support in a Florida divorce, paternity, or custody proceeding and believe your income has changed such that the child support order no longer accurately reflects your financial situation, contact the Law Offices of David L. Hirschberg, P.A. today by calling (561) 288-8620 or by contacting the firm through its website. Similarly, if you are receiving child support, and believe that the payor’s income has significantly increased thereby justifying an upward modification of support, please contact us today.